Is very good filtration good enough when it comes to people’s health? We at Freudenberg Filtration Technologies believe the answer is: no. This is why we took our proven micronAir cabin air filters and made them even better. The new premium model for the best possible protection of passenger health is called micronAir blue. 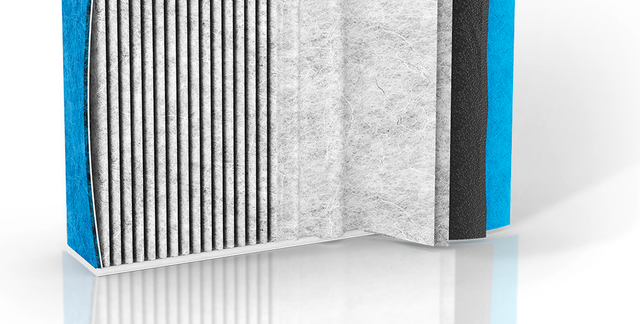 Typical cabin particle or combi filters effectively prevent the entry of soot, dust and foul odors through the ventilation system. micronAir blue also reliably and lastingly keeps out carcinogenic fine dust, allergens and fungal microspores: for optimal, nearly 100-percent protection of passenger airways. The secret behind this success is the patented four-layer design of the effective high-performance filter. The innovative advantage can be found especially in its fourth layer: a patented, medically investigated, biofunctional layer with additives free of biocides and nanosilver. Sounds futuristic. Because it is. And we have something to be happy about: The first ever presentation of the FILTREX Innovation Award from EDANA, the world’s leading association for nonwovens, recognized our trail-blazing contribution to the protection of health.